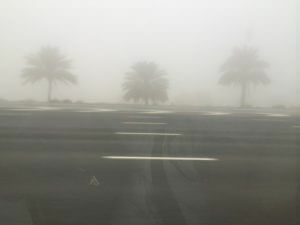 Yesterday we saw the first season fog in Dubai which means that winter is coming soon to the relief of everyone for sure. 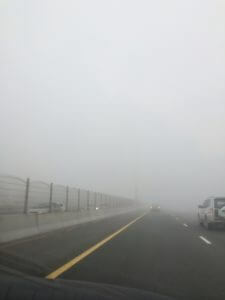 Fog also means dangerous driving conditions and for those who have been in the region for some time will remember the massive pile ups that happened a few years ago on the E11 going to Abu Dhabi. Its pretty much world famous and known as one of the biggest pile ups in history. Even though with our police doing their utmost best in advising people in taking precautionary measures , we still see in the news that every season we have accidents caused by FOG. So here are some precautions and measures that we recommend. 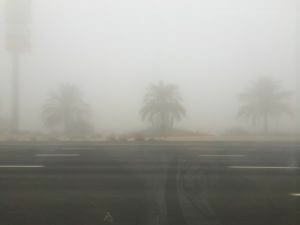 1/ Same as driving through a sandstorm, foggy conditions require that more than usual safe distance is kept. 2/While driving in the slower lanes watch out for heavy vehicles or vehicles broken down on the hard shoulder. Things tend to happen very quick in fog. 3/Drive at a reduced speed and use your hazard lights to increase visibility of your vehicle. If your vehicle is fitted with fog lights then these can be used instead of the hazard lights. 4/Having your car lights on dim would increase your visibility to others. Full beam should be avoided as it just reflects against the fog and reduces visibility. 5/ As with a sandstorm, should you experience a breakdown try an find an exit and park in a safe place.If thats not feasible and you have to park on the hard shoulder please do not stay in the vehicle. Its better to find a safe place outside for all the occupants to wait since the risk of accident on hard shoulders is much higher.